Here is another entry in the totally-useless-but-fun-to-distract-yourself-with category of programs for Linux that make Linux fun. 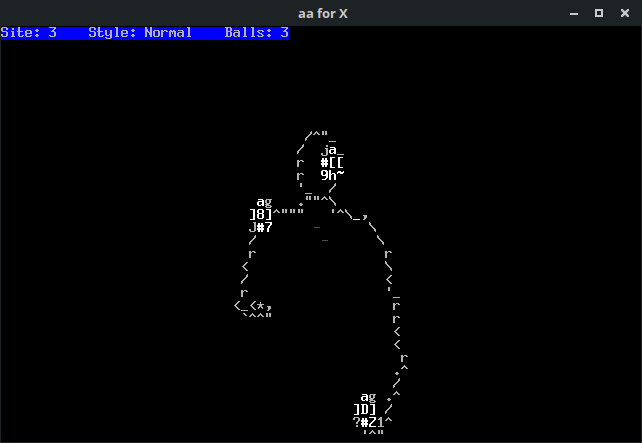 The ASCII art jugglemaster (aajm) program shows a man juggling balls in a terminal using ASCII art. 2048 Game is a seemingly simple shift-the-tile game that can take some skill and practice to complete. The goal is easy: Shift the tiles until you produce a tile with the number 2048. When running Windows 7 as a guest OS (with VirtualBox, for example), here is an apparently obvious tip that can be easy to overlook or forget about: Disable hibernation and paging in Windows 7. This will conserve the amount of virtual hard disk space used by Windows 7 and result in a more space-friendly .vdi image on your real hard drive — especially important if using a solid state drive or NVMe storage. CAVEZ of PHEAR is an arcade-style game that runs inside a terminal. The gameplay is similar to Boulder Dash — actually, it is a Boulder Dash clone — where you must collect all diamonds from a maze while avoiding a squishy demise if excavating beneath boulders. The best part? The game is made entirely in ASCII! The 16.10 versions of Ubuntu and its derivatives were released last month. Xubuntu 16.10 is available for download, and, after trying it out with VirtualBox, I can say that it runs well and continues its tradition of familiarity and stability combined with a responsive user interface.